Irene M. Heim, 87, of Rock Rd., Schuylkill Haven, went home to be with Her Lord on Saturday, November 17, 2018 surrounded by her family. Born on September 27, 1931 in Rock she was a daughter of the late Francis and Jennie Krammes Krause. She was a member of Salem Hetzel's UCC, Pine Grove, where she was an active member for many years. She was the secretary, member of the cemetery committee, Ladies Aid and Best Years and was an Elder. Irene was a pocket setter at Canoe Mfg. in Pine Grove. 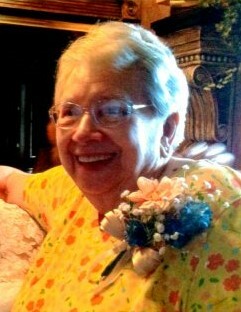 She was a member of TOPS and held meetings at her house for 25 years. Preceding her in death were her husband of 63 years, Malcom C. Heim, a daughter Rita Zimmerman, great grandson Todd Fekete, II, 3 brothers, Lewis, Irvin and Calvin Krause. Surviving are a sister Jean Schlappich of Myerstown; two sons, Leonard (Veronica) Heim of Pine Grove, Richard Heim and companion Joyce of Schuylkill Haven, two daughters, Marna Heim of Friedensburg, Laurie Humphrey of Pine Grove; 13 grandchildren, Rodney and wife Kim Heim, Matthew and wife Danielle Herring, Richard and wife Heather Heim, Corby and wife Angela Lewis, Cory Lewis and Jeanne, Timothy and wife Cynthia Herring, Robert Heim and husband Brad, Lisa and husband Jay Zimmerman, Christine Zimmerman and Chris, Samantha Zimmerman and Bruce, Valerie Fekete and Rich, Jennie Adams and Travis, Rhonda and husband Jerry Halteman; 13 great grandchildren, Victoria Fekete, Skye Herring, Hunter Heim, Bryce Heim, Mallory Lewis, Corby Lewis Jr., Tyler Lewis, Salena Lewis, Timothy Herring Jr., Katie Grace Fischer, Rylie Fischer, Taylor Kurtz, Corrine Kurtz; 1 great great grandson Landon Lewis. Funeral Services will be held on Wednesday, November 21, 2018 at 11:00 A.M.at the H. L. Snyder Funeral Home, Inc., Pine Grove with Rev. Dale Sattizahn officiating. There will be a viewing on Wednesday, November 21, 2018 from 9:00 A.M. until 11:00 A.M. at the Funeral Home, Inc. Interment will follow in Hetzel's Cemetery, Pine Grove.